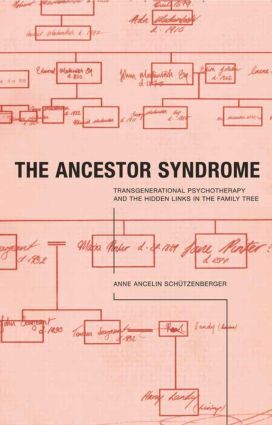 In The Ancestor Syndrome Anne Ancelin Schutzenberger explains and provides clinical examples of her unique psychogenealogical approach to psychotherapy. She shows how, as mere links in a chain of generations, we may have no choice in having the events and traumas experienced by our ancestors visited upon us in our own lifetime. The book includes fascinating case studies and examples of 'genosociograms' (family trees) to illustrate how her clients have conquered seemingly irrational fears, psychological and even physical difficulties by discovering and understanding the parallels between their own life and the lives of their forebears. The theory of 'invisible loyalty' owed to previous generations, which may make us unwittingly re-enact their life events, is discussed in the light of ongoing research into transgenerational therapy. Anne Ancelin Schutzenberger draws on over 20 years of experience as a therapist and analyst and is a well-respected authority, particularly in the field of Group Therapy and Psychodrama. First published as Aie, mes Aieux this fascinating insight into a unique style of clinical work has already sold over 32,000 copies in France and will appeal to anyone working in the psychotherapy profession.